Young Dorothy Gale (Emma Campbell) lives in Kansas with her Aunt Em (Angela Bonacasa) and Uncle Henry (John Hamer). She and her dog Toto run afoul of Miss Gultch (Jennifer Myers), a local woman who is equal parts wealthy and awful. When Gultch threatens to take Toto, Dorothy runs away, only to quickly change her mind. Alas, in the interim, a massive storm has blown in – so massive that it whisks the entire house (with Dorothy in it) to the faraway Land of Oz, where it lands on a witch. Said witch's magic slippers become Dorothy's, thanks to the guidance of Glinda the Good Witch (Bonacasa). But the Wicked Witch of the West (Myers) wants the ruby slippers and will stop at nothing to get them. To get back to Kansas, Dorothy must consult the fabled Wizard of Oz, who lives in the far-off Emerald City. 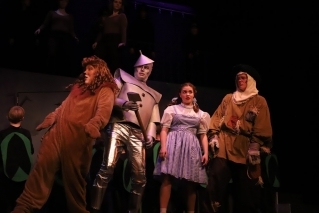 On her journey to find him, she meets a brainless Scarecrow (Brady Kelley), a heart-seeking Tin Man (Drew Myers) and a cowardly Lion (Benjamin Chandler), each of whom joins her on her journey so that they might seek out that which might complete them. They must defeat the Witch to placate the Wizard, but unfortunately, it isn't that simple. Even that is probably more synopsis than is necessary; after all, it isn't like you need me to tell you the story. You might want the company assembled by The Grand to tell it to you, though. There’s something to be said for a straightforward presentation of a classic, a respect for the qualities that make a work so beloved in the first place. That’s what director Leslie Michaud has done with this production. It’s a sweet, energetic piece with a massive heart; there’s a palpable joy to the proceedings – a joy into which an audience can’t help but be swept up. There are a lot of moving parts to a show like this one – it’s an undeniably large-scale effort – but Michaud deftly manages the flow of traffic. On the performer side of things, you obviously have to start with Dorothy. It’s an iconic role that likely puts a lot of pressure on anyone who takes it on, but young Emma Campbell handles it effortlessly. It’s a wonderful turn, both emotively and vocally. As for her travelling companions, it’s an engaging trio. Kelley’s Scarecrow is all rubber-legged credulity, while Myers brims with steadfast sincerity as the Tin Man and Chandler gives us a Cowardly Lion that is broad and endearingly goofy. Bonacasa and Myers command the stage in dual roles – the performers offer up two equally interesting sides of the same coin. Both serve as foundational pieces of the larger whole. Meanwhile, Hamer has some moments as dust-dry Uncle Henry and the weirdo guard at the Emerald City gate. And then, there are the rest. The ensemble features literally dozens more performers, child and adult alike. They are the ones who fill in the world around the main characters. While they are too numerous to list as individuals, the show simply could not be without their hard work. In a lot of ways, they ARE Oz. Unfortunately, this production was unable to use live music as The Grand is struggling with an aging sound system. The canned music, while perfectly adequate, was a bit lacking in liveliness. 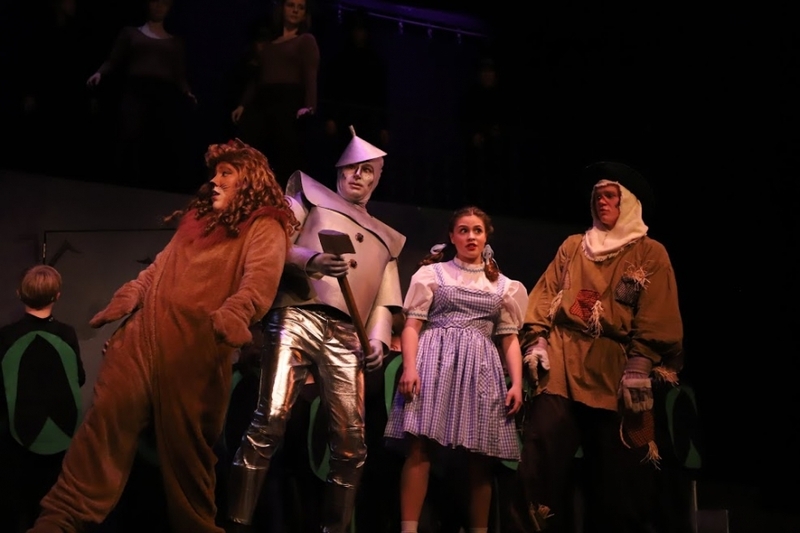 However, the cast, under the guidance of music director Ashley Terwilliger, largely overcame that sense of remove, leaning into the musical numbers with a gusto that served as a needed injection of energy. On the technical side of things, The Grand has assembled a solid team. Set designer Preston Krenicki, lighting designer/props master Theo Dumas, sound designer Nick Turner and costume designer Stephanie Urquhart have come together to create a Land of Oz that is very merry indeed. Peter Miller’s effects works warrants specific mention – the projections in particular. The Grand is expanding the extent of their live theatrical offerings, with a full season of performances coming our way. We should hope that they’re all as enthusiastic and entertaining as this one, a fun, sweet show that will captivate children and entertain adults. All in all, “The Wizard of Oz” is another grand time at The Grand.